You might also see an ad with more links so you can quickly find a specific page in an advertiser’s website. If you're researching airfare to visit your relatives for the holidays, it saves time to go directly to Priceline's page about booking flights, rather than the general homepage or rental car page. Or, if you’re trying to find a holiday bouquet to bring to your dinner party hostess, you might see an ad that shows your local florist's location on a map and provides driving directions. 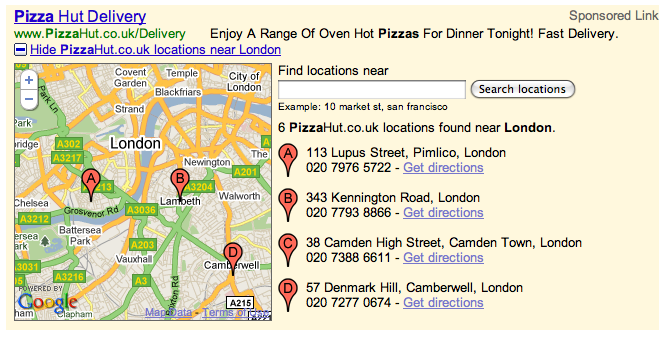 Other new ad formats might help you find all the addresses and locations of a chain store in your area. 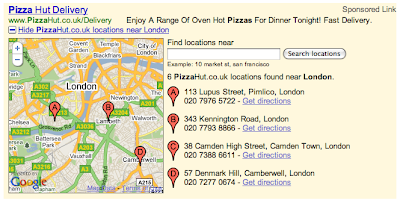 So if you're vacationing abroad this season and have a craving for something familiar, the ad might show you all the nearby Pizza Huts that can deliver to your hotel. And starting today, you might spot ads that include images and prices for specific products. When shopping for the ski outfit your nephew has been hinting about all year, you might see pictures from the retailer’s inventory to help you quickly determine if they have the color and style you had in mind. Still other ad formats may introduce new ways of presenting information, such as Comparison Ads, which allow you to specify exactly what you're looking for and to compare rates and prices in a single location. With the approaching new year comes resolutions to get things in order, so you might want an ad that lets you see side-by-side refinancing offers. While we experiment with new formats, we'll remain loyal to our core principle: that getting the right ad to the right person at the right time matters. As we continue to think up innovative ways to give you the information you want, you’re likely to see even more ad formats until we pinpoint the most useful, relevant and engaging ones. We’ll keep trying new things until we discover the “perfect” ads that improve your overall search experience. At Google, we're committed to giving you the information you want — regardless of the form in which it might appear. Text is often useful, but sometimes videos and pictures are a more effective way to receive information. For example, if you want to learn a magic trick, a video showing you how to perform the trick is likely the best result. 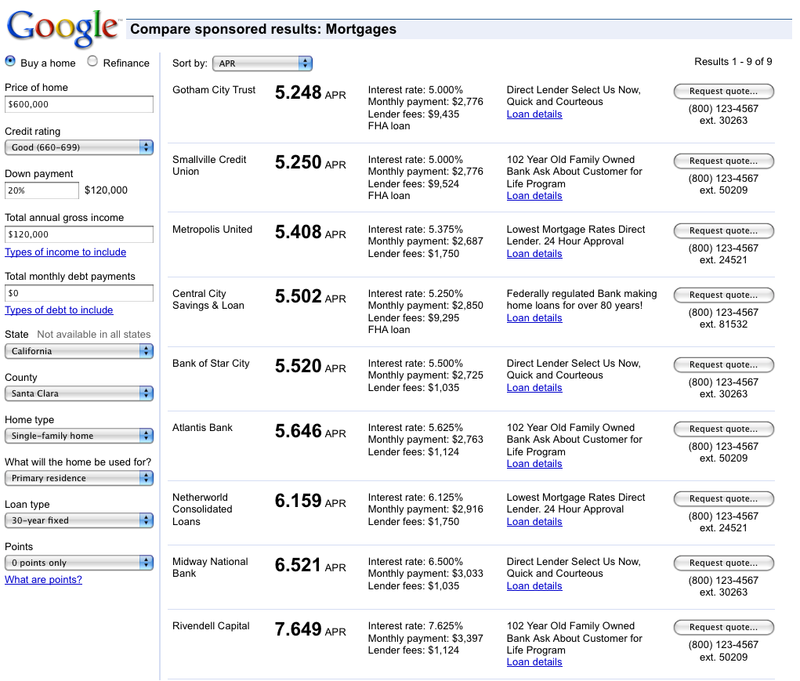 So over the past few years, we've blended videos, images, maps and more into the search results on Google.com. It also makes sense to provide you with richer types of information in the ads. If you're looking to buy your mom a new handbag for the holidays, for instance, you might want to see pictures, prices, the addresses of boutiques in your area and a map of how to get there — all within the ad. To provide a better search ads experience, we've been developing and testing a variety of new ad formats. These formats are focused on giving you the information you need, while retaining what you love about Google advertising: that the ads are relevant and useful. 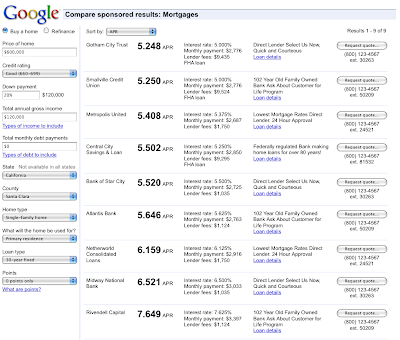 If you’re in the U.S. you may have already seen a number of these ad formats when searching on Google. Some of them include visual elements. For example, if you’re curious about the movies that are playing this holiday season, you might see an ad with a video that lets you watch a trailer.